Sony has just introduced a pair of new, Bluetooth-based wireless earbuds that combine light weight, digital noise cancellation and sweat resistance that makes them suitable for workouts. The new earbuds go by the brilliant WF-SP700N (for the cord-free model) and WI-SP600N (for the neckbuds) names, and Sony claims they are the first one to combine BOTH noise cancellation features and water resistance. First, the WF-SP700N, the "true" wireless kind: battery life on them is 3 hours, considerably less than the 5 hours you get out of the popular AirPods and Samsung's Gear IconX. Sony claims strong bass output and a "one-touch open" case that can provide 9 additional hours of charge. Water protection is rated at IP4X, meant to give enough protection for those sweaty workouts, but not more. The earbuds' price is set at $180 and they will ship this spring. 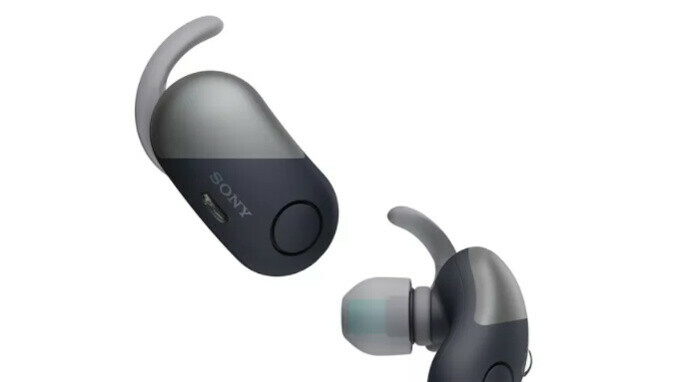 Next up, Sony introduced the WI-SP600N neckbuds that looks somewhat similar to the Google Pixel buds. The pair features identical noise cancellation and IP4X sweat-resistance capability. Battery life here is better because of the form factor: you get up to 6 hours of continuous playback. The price for these earbuds is set at $150. 13 years ago Sony did the exact same thing: 6 months after their original, hi-end, metal-body HDD walkman (NW-HD1), they released a cheaper, colorful "youth edition" (NW-HD3). This is the youth edition counterpart to the WF-1000X. Same generation, same platform, same technology. There are other examples of this release pattern, going back to the early 1980s cassette walkmans. It's funny how companies continue to make the same choices, even when they don't have much of the same employees anymore. The audio engineers are very much the same people 25+ years ago. Sony introduced 3 new versions. They also introduced a 8 hour version as well. Why didn't PhoneArena mention those as well? If you are going to report, then go all the way. I remember when Sony use to be what Apple is to us today. Had a lot of great products then and (Still do). Imho Sony was never something special in Europe, sure they introduced Walkmans, were part of DVD standard development and recently made first usable bluetooth codec (LDAC). They make really good TVs, mostly mediocre headphones, ok-ish speakers and radios, Playstations, really good, but ugly phones, non-competetive MP3 players etc. but do they make anything they are great at? It's an honest question. I tried the WF-1000, and they are TERRIBLE! The right unit disconnects frequently, and video are not synced with audio. If these follow the same DNA and innards of the WF-1000, do not bother getting any of them. IconX 2018 with actual 3.4 GB for audio tracks, ambient sound choice, audio coaching, 5 hours streaming time , and touch controls are well worth it than any of the competition. They are loud with ample bass, and are correctly synced with video.